Can you prepare a healthy, balanced meal for your family from the local farmers market? How are fresh foods more nutritionally sound than packaged foods you purchase at the grocery store? What benefits are provided from shopping locally? Visit the local farmers market and create a meal for your family that is healthy, balanced, and local. Coppell spring market is open from 8:00am until noon. Take a picture while you are there to verify your attendance and email to our photobucket. What did your family think about your cooking skills? Would you visit the farmers market again? Fresh foods are more nutritional because packaged foods at the grocery store have a lot of preservatives to keep them fresher longer. Benefits from shopping locally provide fresher, healthy and good food to prepare more balanced meals. My mom is such a good cook and cooks delicious healthy food every night. My cooking skills aren’t quit up there with hers yet, but they said my food was pretty good. They were either being nice because they are my family, or they actually meant it. I thought it was pretty tasty myself. I will definitely be visiting the farmers market again. I went to the one in Dallas on a Friday, so there weren’t as many venders their selling food as there would be on the weekend. It was so cool to see all the different kinds of fresh foods that they had to offer. I will probable end up going to the Coppell Farmers Market, because it is more convenient for me to go to, but I will go back very soon! My family and I visited the Coppell Farmers Market last Saturday morning in search of food to make a healthy breakfast. We purchased free-range eggs, preservative free bacon, fertilizer free blueberries and whole grain flower for pancakes. The meal was absolutely delicious and I felt satisfied with our food selections. The biggest difference we noticed was in the pancakes. Regular from-the-box pancakes taste like wheat-flavored glue compared to our whole grain recipe. Also, we felt more full after fewer pancakes because we were eating naturally filling food. The main benefit with shopping locally is that I know I am helping local business that spend extra time and money ensuring that their product is fresh and healthy. 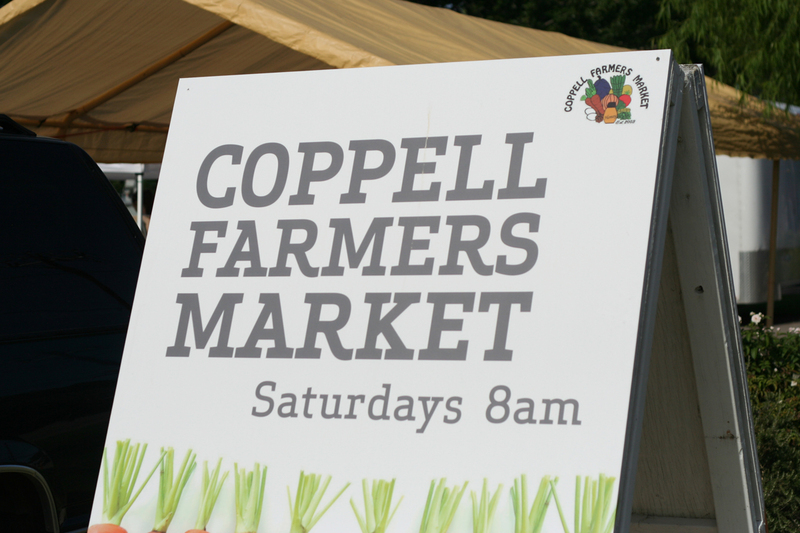 I try to visit the Coppell farmers market at least one a month to get the best local produce. Panida and I stopped by farmers market in search of healthier food options. Fresh foods bought locally are free of preservatives and other added chemicals which are unhealthy for the body. When shopping locally you can be sure of getting high quality products. I am also directly helping the community with my purchases and the local businesses.After trying the many food items they had to offer I knew I had to buy something, I bought a large tube of honey and some goat cheese. Daniel M. and I went to the farmers market on the last saturday of march. We saw the fresh plants and also meats. It is a family friendly place and had foods like fresh apples and goat cheese. I forgot that I can not eat goat or lamb so when I tried the goat cheese, I almost threw up. Even though I didn't enjoyed the goat cheese, my friends told me that it was the best cheese they've ever tasted so they bought a few wedges. They continued to buy honey and we shared a basket of apples. It was very fresh and it was refreshing. There's not only produce there but also dog treats and home accessories. Overall, it was a great experience and I would go back again this saturday. I went to the farmers market on March 23rd. I am a pretty terrible cook to be honest. My cooking skills pretty much extend as far as making a sandwich. So I bought some honey from the farmers market and made my family some peanut butter and honey sandwiches. The honey was absolutely delicious. It was so much better than any honey you can buy from stores. Fresh food tastes so much better than store bought food. I would definitely visit the farmers market again. It was a very interesting experience and i look forward to going again. Also they even have a band playing for entertainment. Fresh foods are much more nutritional than packaged food in stores because they do not contain the preservatives the packaged food does to keep it fresher longer. By shopping locally, you can get fresher food that is healthy and tastier than the food packaged in stores. I went to the farmers market on March 23rd and I thought it was really interesting. There wasn't much going on but I got a bottle of raw honey for my tea and I thought it was amazing. I liked it much better than my regular honey. I would like to visit the farmer's market again, but only if I actually get up on time. I was easily able to prepare a healthy and balanced meal using items from the local farmers market. They had a variety of fruits and vegetables and even sources of protein such as beef, chicken, and pork. These fresh foods are more nutritionally sound than packaged foods because they are usually organic and grown with fewer fertilizers. The benefit of shopping locally is that I am supporting local farmers while also helping myself eat healthier. I went to the farmers market on March 23 and bought potatoes, chicken, lettuce, and homemade salad dressing. My family really enjoyed the roasted chicken and potatoes as well as the salad I prepared. I would definitely go back to the farmers market because the food tasted very fresh and delicious. This Saturday I went to the Coppell Farmer’s Market with my mom in search of some healthy foods. There were a variety of meats, fresh spices, and fruits to pick from. We ended up buying beef, fertilizer free blueberries, and raw honey. That didn’t really make up much of a meal per say, but after trying each of those, I could really tell a difference in the taste of those versus those same items store bought. Fresh foods more nutritionally sound than packaged foods you purchase at the grocery because when foods are processed a lot of their nutritional value is lost and replaced with man-made and unhealthy fillers that add taste but through empty calories, sugar and carbohydrates. The benefits provided from shopping locally are that the food is fresher, better tasting, and healthier and I was helping support the community. I really enjoyed going to the farmer’s market, it was a good experience and I would definitely go again.